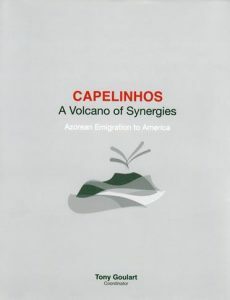 Alongside the book ” Blindness ” written by the Nobel Prize for Literature José Saramago, also selected for the same purpose, the book of the Portuguese Heritage Publications of California, a publication coordinated by Tony Goulart , during the commemorations of the 50th anniversary of the Capelinhos volcano. The book eventually received the distinction and its prominent place that much honor and dignify the work of the publisher and its coordinator, as well as all contributors to the project from California , New England and the Azores, including the Committee Capelinhos 50/California, who participated in the preparation of this important document, as well as the Regional Secretary for the Communities and the Presidency of the Azores Government, who supported the publishing initiative. Tony Goulart was invited by Leslie University to make a presentation on November 14th. as Keynote Speaker of the 2013 Cultural Studies Special Lecture . The lecture , which will be open to the academic community of Leslie University and guests, will be held from 5:30 to 6:30 pm in University Hall, 1815 Massachusetts Ave, Cambridge, Massachusetts. After the lecture, a reception will take place at the same location. Are you looking for information on your Portuguese family ancestors who have immigrated to California? Are you interested in researching the history of Portuguese throughout the world? If so, this blog is for you! Often PHPC website visitors researching family ancestry, or simply curious about the history of the Portuguese in California, will inquire as to where they may be able to find resources to help in their research. Today we are bringing to you an extremely valuable and helpful resource to those research jocks interested in Portuguese history in general and Portuguese immigration to California in particular. Today the J.A Freitas Library is home to a book collection consisting of 11,914 works dealing with the Portuguese throughout the world, including many titles documenting the Azorean immigration to California. Library visitors will also find an extremely valuable, and fairly complete, sample of periodicals published by the Portuguese in California, some dating back to the 1800’s. We hope that you find this information useful in your research efforts.